In 1998, Chuck Templeton, a former U.S. Army ranger, while observing his wife’s futile attempts to book a dinner reservation in San Francisco by phone, came up with an idea of creating his own booking service. With OpenTable, a restaurant reservation company, he literally brought online the whole food service industry in the US. Since its very inception, OpenTable has taken over a monopolistic market dominance which guaranteed a permanent growth to the company. During the 2009-2014 period, OpenTable made 8 acquisitions of potentially rival companies, and in June 2014 the company itself was bought for $2,6 billion by the Priceline Group, an online travel giant whose other brands include Booking.com, priceline.com, agoda.com, and KAYAK. Today, having broadened its service geography to 18 countries, OpenTable is still at a leading position as a restaurant reservation service with the most considerable market share. However, with the growth of the mobile app market, which triggered creation of numerous restaurant reservation apps and systems, OpenTable started losing its dominance, even though the company was the first to reach the mobile frontier. Some of OpenTable’s newly founded competitors include Yelp's SeatMe, San Francisco-based mobile app like OpenTable; Reserve, another San Francisco-based restaurant app developers leaded by Uber's co-founder, which focus on top-end restaurants; New York-based Resy with its offer for paid last-minute-reservations; and TableSavvy, one more last-minute-reservation service from Chicago which offers daily 30% discounts at a $5 reservation fee. 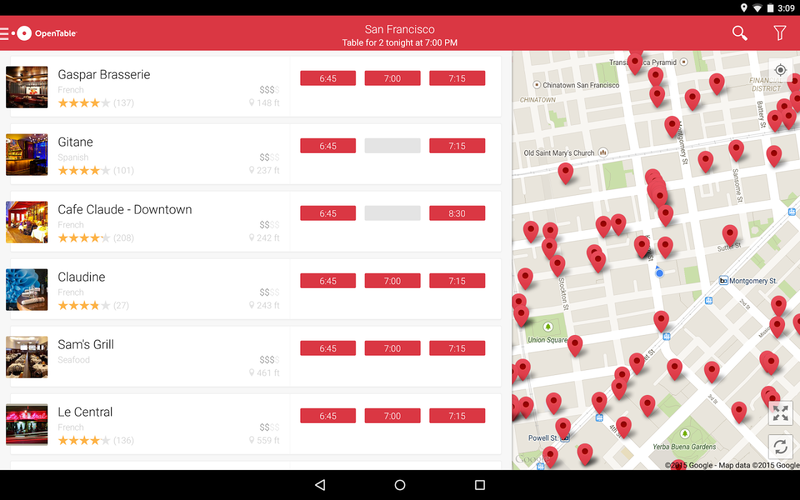 If you're interested in developing a reservation service app and want to answer the question "How much does OpenTable cost? ", let's see what technologies you need to connect diners with restaurants and how OpenTable makes money from reservations and subscriptions. OpenTable employs different channels to connect customers to their service. These channels include a website and mobile apps for iOS, Android, and Windows platforms. The OpenTable - Restaurant Reservations, Reviews, Menus, Local Food & Dining app was originally launched for iPhone in 2008. In 2009 it came to Android. According to the OpenTable’s reports, in the first quarter of 2018 it seated more than 1.6 billion diners worldwide through its mobile solutions. This represents more than $66 billion that OpenTable brought to its restaurant customers. I only mentioned it to say that developing an app like OpenTable can be a very profitable initiative for both parties involved in table reservations. Anyway, we’re here to discuss technology stack for mobile application development, so why don’t we just focus on the most important functionality that the OpenTable app provides for diners? This includes restaurant discovery features, rewards, and online payment. Location-based search, history of bookings, and user-generated reviews are the features that the reservation application like OpenTable should use to help its customers discover restaurants. To use OpenTable’s mobile app, first of all, you need to create an account using your email address and a password, or you can simply sign in with your Facebook account. Then, the very first screen will give you suggestions based on your current location. The suggestions include a list of restaurants in a given area, their ratings based on users’ reviews, and available reservation time. You can search for a specific place, city, neighborhood, and filter suggestions by location, cuisine, price, rating, etc. Also, you will have to choose the time and number of people attending a restaurant with you. Other than a venue’s location, ratings, and menu, the app also provides other information on a restaurant such as its phone numbers, prices, open hours, payment options, parking availability, and a short description of a place. Still, not all tables can always be reserved via OpenTable. Since restaurants are synchronized with the OpenTable database through their own Electronic Reservation Books, they can block some tables from online reservation, especially in peak hours. In this case, if you still want to book, a classic phone call can work just as fine. Apart from a restaurant search, users can see the history of restaurant reservations they have made before. This feature provides users with a quicker access to the places they have already visited. It may really come in handy in case you have forgotten the name of a restaurant you liked. Diners can post a review on opentable.com, or use a mobile app for the same purpose. They can leave comments and rate a restaurant’s food, ambiance, and service from 1 to 5. Unlike Yelp, OpenTable doesn’t let just anybody post a review. You have to be confirmed as seated at the restaurant that you wish to tell the world about. On the one hand, user-generated reviews is a valuable feature that contributes to positive user experience and serves as an effective bait for new customers. On the other hand, some reviews may harm a restaurant’s reputation including those of them that aren’t necessarily truthful. A system of rewards in a mobile app makes users feel more engaged with the functionality an application offers. OpenTable uses a Dining Rewards program, or a system of loyalty points. This means that every user will get 100 points to his or her account for each reservation made through the service. They will also get additional 1,000 points or a chance to get a special off-peak table in case a restaurant participates in the pay-for-performance marketing program (more about POP program is the next paragraphs). Once a user has collected 2,000 points, she can convert them into a Dining Rewards Gift sent to her email. She can print out a gift card or simply show it in a restaurant from her phone. Users can also purchase giftcards on the OpenTable’s website or redeem their loyalty points by converting them into a $20 Dining Cheque that can be used at any restaurant in the OpenTable’s list. The amount of money on the dining cheques varies depending on a country. Participating restaurants send their customers’ cheques directly to OpenTable to get refunds. Last year booking software app OpenTable launched a "Pay with OpenTable" feature, which allows iPhone and Android users to pay their checks using the OpenTable app. Diners can either add their credit cards to the OpenTable app and pay whenever they need to or they can use Apple Pay. We already wrote about Stripe and Braintree, the most popular payment systems. It isn’t a surprise that OpenTable chose one of them to handle their mobile payments. Partnership with Braintree allows OpenTable to securely process payments that go through the app. What’s more, OpenTable recently integrated its "Pay with OpenTable" app with the industry-leading NCR’s Aloha Point-of-Sale system. The NCR provides an API platform, which is a cloud-based gateway that allows apps like OpenTable to connect to the NCR’s servers to provide their customers with an easy way to pay on their smartphones. Restaurants that work with the NCR Aloha POS system can drive loyalty and engagement by letting their customers pay when they want using the OpenTable mobile app. There is no need to wait for a bill anymore! Earlier this year, OpenTable released an app for Apple Watch thus picking up the hottest today's trend. The function of this app is to remind users about their upcoming reservations. It also notifies diners if they can pay using Apple Pay in a chosen restaurant. OpenTable’s main client isn’t diners, it’s restaurants since this is where the revenue comes from. OpenTable is a service and product company at the same time. This particularity lets them effectively monetize using two models of monetization. They make revenue from restaurant reservations and also sell subscriptions to their products. How does OpenTable make money from reservations? While the services that OpenTable provides for diners are absolutely free, the restaurants are charged $1 per customer in case a reservation was made on opentable.com, via the OpenTable app, or the OpenTable widget on any website, including a restaurant’s website. The company also charges participating restaurants $0.25 for diners who reserved a table using a reservation page on a restaurant’s website. The only situation when restaurants don’t pay anything to OpenTable is when a reservation is made by phone. As we already mentioned, restaurants can also participate in the pay-for-performance marketing (POP) program, the idea of which is to reward users who reserved a table with additional 1,000 dining points. In this case, a restaurant is charged $7.50 per a seated guest. This seems way too much, right? On the other hand, though, it’s an effective way for restaurant owners to fill empty seats during off-peak hours. How does OpenTable make money from subscription? Making reservations through OpenTable application wouldn’t be possible without special reservation tools. Selling subscriptions for using these tools is the second source of revenue for OpenTable. A participating restaurant must pay a one-time fee (up to $700) for installation of the Electronic Reservation Book (ERB) and training its employees how to use it. The ERB is a touch-screen computer terminal that runs pre-installed software that allows managing online reservations, cancellations, no-shows, seating arrangements, and waitstaff assignments. It also stores information on customers, tracks their activities, runs email campaigns, and more. OpenTable charges restaurants a $199 monthly subscription fee for using their software. Naturally, all the data on clients belongs to OpenTable, so restaurants are actually paying for the right to access their customers’ info. OpenTable also offers a few free solutions that allow restaurants’ owners to access their ERB remotely. Web-based OpenTable Launcher and OpenTable Remote Manager for web and iPad offer similar functionality to the ERB. 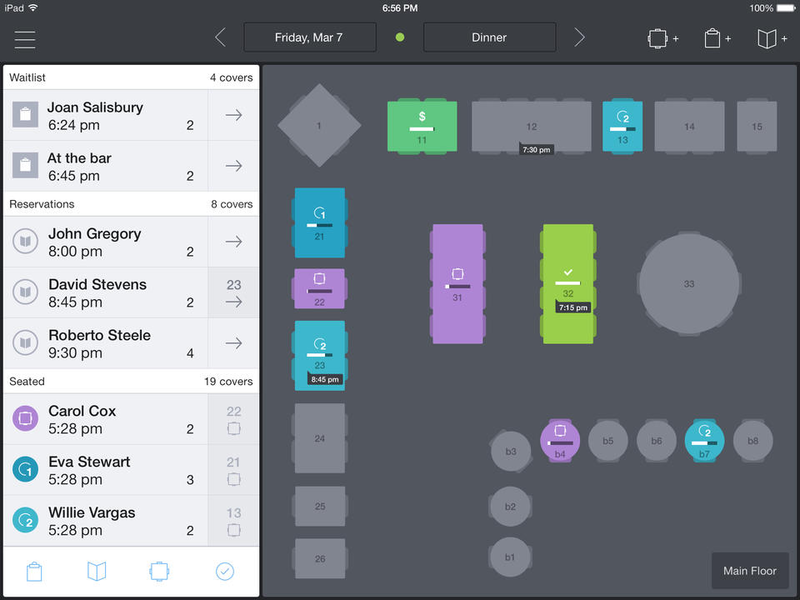 Another free solution that OpenTable provides to participating restaurants is Guest Center, an iPad and web app that helps a restaurant’s personnel to manage a floor plan, optimize guest seating, etc. Moreover, the company offers the OpenTable Connect, an alternative to the ERB which targets smaller restaurants. It comes for a lower subscription fee (only $50 per month), but a reservation per customer will cost $2.50 instead of $1 (it’s still $0.25 in case a reservation is made through a restaurant’s website). Do you actually need OpenTable for your own restaurant? I have compared OpenTable’s quarterly financial results for 2011 and 2014, and I can definitively say that the largest and the most dynamically growing revenues come from reservations. That’s because more and more restaurants are willing to partner with OpenTable. Yet, the revenue from subscriptions is also quite impressive. Of course, participating in the OpenTable’s programs gives restaurants, especially newly opened ones, a great ground for promotion. Among other benefits, participation also means being part of the world’s largest restaurant database which has been growing since OpenTable's reservation company just started. OpenTable also allows other websites, such as restaurant directories, food blogs, movie venue sites to earn inremental revenue from their visitors by participating in the OpenTable's Affiliate program. Affiliates obtain access to the FTP site of the North American and UK's restaurant addresses and restaurant IDs in order to implement referral links. At this time OpenTable doesn’t offer an API. But you may check out an unofficial API. If you want to integrate OpenTable's reservation features in a restaurant app or website, you can do it using a widget which will allow you to create a restaurant reservation form for your website, or you can use your restaurant's Facebook page. Despite the increasing interest to OpenTable, not all restaurants' owners approve the system it offers. Some of them don’t see the point of spending extra funds on setting up an online reservation system, especially if they already have a stable customer flow. Others would like to hold tables for special customers, and not just random diners. There are also restaurants that prefer sticking to old school pen-and-paper booking. What's more, the cost of the OpenTable's services is high. Maybe, instead of paying money to online reservation companies it’s better to think how to develop your own restaurant? Momofuku, an international group of restaurants, uses the OpenTable services alongside its own reservation system. Chicago-based Alinea is another example of a restaurant which has recently introduced a ticketing platform. The platform allows diners to make reservations by buying tickets to the restaurant or booking them for free. This unusual idea makes guests feel as if they're attending a theater or show rather than a restaurant. We suggest that you take a closer look at the opportunity of growing your business without engaging any third-party players. Besides, our developers can always help you create an app like OpenTable!